Improving the fuel efficiency of cargo trucks will help the Greater Mekong Subregion reduce carbon dioxide emissions as well as boost the competitiveness of road freight companies. Photo credit: ADB. Transport is a major contributor of carbon dioxide, emitting 7.5 billion tons or 18% of the world’s total in 2015. Emissions by the transport sector are growing at a higher rate than total emissions. By 2050, transport emissions are expected to rise by 60% even with significant technological progress to reduce them. Road freight accounts for half of transport’s emissions. In Southeast Asia’s Greater Mekong Subregion (GMS), transport contributes approximately one-fifth of energy-related carbon dioxide emissions, excluding the People’s Republic of China. Road freight is a significant source of emissions, transporting more than 80% of goods in the subregion. Small and medium-sized enterprises run most of the truck fleets. The use of road freight has increased in most of the six GMS countries, while the use of rail and shipping has decreased. This trend is likely to continue as road infrastructure investments continue to be a priority for the subregion. Since 1992, the GMS Economic Cooperation Program has invested more than $15 billion in transport infrastructure. A considerable portion of the $64 billion in planned investments under the GMS Regional Investment Framework, 2022, will also be in this sector. This policy brief was adapted from a paper presented at the 5th GMS Environment Ministers’ Meeting in Chiang Mai, Thailand on 30 January to 1 February 2018. Measures to improve fuel efficiency will help reduce greenhouse gas (GHG) emissions and improve the profitability and competitiveness of road freight companies in the subregion. Fuel accounts for 40%–60% of their operating costs. The subregion can increase fuel efficiency and cut down emissions in road freight through the avoid-shift-improve approach. Avoid freight transport in the first place. For example, through industrial clustering to reduce transport trips, and better logistics to avoid empty backhauls. Shift transport from road to rail, road to shipping, and road to pipelines. Roads have higher emissions per ton-kilometer by a factor of 3 to 10 times than rail or shipping. Increasing investments in waterways and railways, and making both more efficient, will be essential for shifting more road freight to these modes of transport. Improve the fuel efficiency of road freight. This entails improving the load factor, reducing fuel consumption and emissions per unit of distance driven, and switching to cleaner fuel. Green freight programs have emerged in the subregion in recent years to promote cleaner technologies and improve fleet management. From 2013 to 2016, the GMS Core Environment Program’s Green Freight Initiative, which focused on long-haul road freight, helped 60 small and medium-sized freight companies in the Lao PDR, Thailand, and Viet Nam to test ways to make their businesses more fuel-efficient. German development agency GIZ supports an additional 500 small- and medium-sized companies under its European Union-funded technical assistance project for Sustainable Freight and Logistics in the Mekong Region (2016–2019) in Cambodia, Lao PDR, Myanmar, Thailand, and Viet Nam. The pilot phase of the Green Freight Initiative tested three types of fuel saving measures extensively—aerodynamic devices, efficient tires, and eco-driving. Air resistance can significantly affect the fuel consumption of trucks, depending on the speed. In most GMS countries, truck speeds are relatively low because of difficult road conditions and the predominance of low-powered, heavily loaded trucks. Cab-roof deflectors are the most viable device to reduce drag, which cuts fuel consumption and emissions. Retrofitting trucks with cab-roof deflectors can result in fuel savings of 3%–5%. In countries with high truck speeds (over 70 kilometers per hour), side deflectors and other aerodynamic devices can further reduce drag. Low-rolling resistance tires—which work well at both low and high speeds—can achieve fuel savings of 4%–6%, and they last longer than conventional tires. The major tire makers sell them in GMS countries. Because efficient tires are quite expensive, these are not widely used by trucking companies, despite cost savings. The European Union has successfully implemented a tire label and directive that obliges tire makers to sell fuel-efficient tires. Eco-efficient driving reduces fuel consumption and improves road safety. It is about smart driving techniques, shifting to high gear early, and using the most efficient gears and braking techniques for uphill and downhill driving. Eco-driving training for truck drivers usually takes a day and involves training on trucks or truck simulators. Eco-driving can bring cost savings of 3%–5% on fuel. Many countries around the world require truck drivers to have eco-driving skills to get a driver’s license or renew one. The Green Freight Initiative developed an eco-driving training course for driver instructors. Under this program, 40 instructors were trained in the three pilot countries in the subregion. They have since trained some 300 truck drivers. Field tests of retrofit technologies carried out in GMS countries under the Green Freight Initiative showed 9% to 14% fuel savings from using aerodynamic devices and efficient tires and maintaining correct tire inflation during the trial period. When these technologies were supplemented by eco-driving, fuel savings rose by 11%– 17%. Field testing of eco-driving by GIZ yielded an average of 13% in fuel savings after the training. However, since the effects of training wanes over time, regular refresher training is necessary. Financial analyses showed that cost savings on fuel from many of these retrofit technologies will cover investment costs within less than a year. These technologies can be enhanced by the following measures to increase fuel savings of road freight in the subregion. Scrapping and replacing older trucks can help reduce carbon dioxide emissions and improve road safety, as fuel efficient and cleaner technology becomes available. That said, this is not having much of an impact currently since the fuel efficiency of trucks has not improved much in recent decades. Scrapping and replacing older trucks is also costly and can distort market structures. If GMS governments do decide to implement old truck scrapping and replacement programs, these should focus on urban trucks, as these have a significant impact on air quality and health. Gas-powered trucks can be cost-effective and help reduce overall emissions in road freight, contributing significantly to reduce air pollution in urban areas. A downside is that the GHG emissions of gas-powered trucks are the same or even higher than diesel trucks because of methane slip or when gas leaks unburned through the engine. Some urban areas, such as Zurich, have started to use hybrid and electric trucks of up to 18 tons. Of the two, electric trucks have a larger potential for reducing air pollution in urban areas. Allowing larger trucks on the road greatly improves transport efficiency by better matching trucks with loads when a larger load is available. This reduces fuel consumption, transport costs, road congestion, and emissions. Larger trucks do not automatically increase damage to roads by being heavier but offers the potential to better optimize the load factor. Increasing the maximum allowable weight for trucks can be an important measure to reduce emissions and improve freight efficiency. Empty running makes up 25%–50% of trips made by freight companies in the subregion. Improving logistics measures could increase fleet optimization to better match load and reduce empty backhauling. These include electronic platforms for load consolidation, drop and hook (i.e., truck driver delivers a trailer and hooks up to a new trailer), and freight consolidation centers. Technologies that integrate telecommunications, global positioning, and informatics or telematics can also help minimize empty running. Global experience has shown that logistics measures such as these are best managed by the private sector. Cooperative alliances between companies can help address market inefficiencies, i.e., fragmentation across freight companies and lack of networking within the sector. In general, green freight programs are national-level initiatives that bring together key stakeholders to achieve a number of objectives. These include increasing the fuel efficiency of the freight sector, ensuring safety and sound working conditions, improving the economic efficiency of freight and the competitiveness of national economies, and reducing emissions and air pollution. Typical program components include the development of a green freight standard, data collection and management, as well as labeling and recognition of companies that meet the standard. 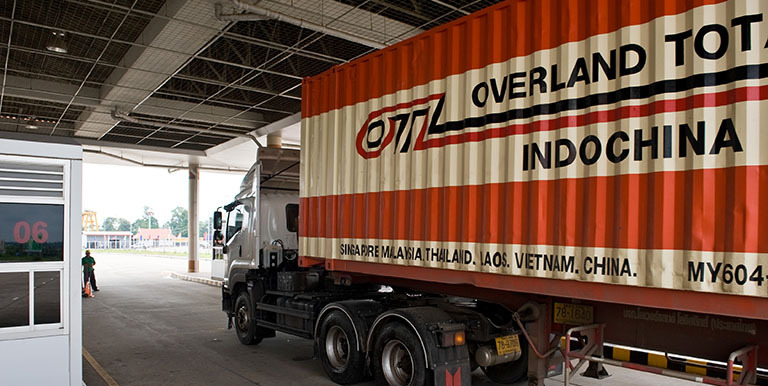 Viet Nam is currently developing a green freight standard and label with GIZ support. The efficiency measures discussed in this paper, such as eco-driving and using larger trucks, are all cost effective and offer positive returns on investment. But like many other efficiency investments, they face barriers to their widespread use. Efficiency equipment has fairly high upfront costs with insecure returns. Unfortunately, these costs are very visible, while the efficiency gains tend to be less well appreciated because they occur over time. Trucking companies tend to focus on their core business (haulage) and are reluctant to invest in efficiency-improving resources. Split incentives, where truck drivers are paid a fixed fee, including fuel per trip, reduce the incentive for operators to invest in vehicle improvements. Smaller fleet operators have limited access to finance needed for fleet or technology upgrades. There is a lack of an enabling policy framework for trucking companies to invest in technology and operational measures for fuel efficiency, as governments do not see or appreciate the public policy benefits of green freight and logistics. The following two-phased approach is suggested to remove these barriers. The first phase is based on voluntary participation and involves financial incentives for first movers who pay partially for the incremental costs of aerodynamic equipment, efficient tires, and other fuel efficiency measures. It involves introducing a labeling scheme to create awareness of the types and benefits of fuel saving measures (e.g., efficient versus normal tires). An eco-driving course is developed, instructors trained, and truck driving schools equipped with simulators. Implementing this phase requires financial incentives and subsidies to prepare the ground for the second phase. Incentives can also be used in the first phase to encourage the use of hybrid and electric trucks. The second phase introduces compulsory tire efficiency standards, which become progressively more stringent, and makes eco-driving a compulsory part of truck driver training for new and renewal of licenses. This should result in large fuel savings nationally, as the performances of all vehicles improve. Low-carbon trucks can be made compulsory for heavily polluted urban areas, and financial incentives given to promote the switch to these trucks. Comprehensive and clearly staged green road freight plans have the potential to attract climate finance to subsidize the investments needed to implement the first phase. GMS countries can approach the Green Climate Fund for this, though they will need to present a concrete plan for how transformational impacts will be achieved. The steps for attracting climate finance include setting up green freight nationally appropriate mitigation actions (NAMAs). The GMS Core Environment Program is supporting Viet Nam in developing such a NAMA. This will help the country identify the measures and policies needed to attract climate financing and to assess the environmental and economic impacts of these measures and policies. Viet Nam’s NAMA proposes to implement aerodynamic devices on trucks, compulsory eco-driving training, the scrapping of older trucks, and norms for minimum tire efficiency. These measures are expected to reduce transport emissions by 6% and bring yearly fuel savings of more than $200 million and annual environmental savings of $50 million. The annual cost of implementing these measures is about $55 million. Table 1 presents the estimated impact of each measure and their cumulative impact. CO2 = carbon dioxide, , LRR = Low Rolling Resistance, NO2 = nitrogen dioxide, PM2.5 = particulate matter 2.5, SO2 = sulfur dioxide. Source: Grutter 2017, Green Freight Nationally Appropriate Mitigation Action Viet Nam. Table 2 shows the expected capital expenditure, cumulative operational expenditure, cumulative financial and economic savings, financial internal rate of return, and economic internal rate of return of the NAMA. CAPEX = capital expenditure, EIRR = economic internal rate of return, FIRR = financial rate of return, MUSD = million United states dollar, OPEX = operational expenditure, . Although these measures offer high financial internal rates of return, they have not yet attracted investors in Viet Nam or the other countries that have NAMAs. Initial subsidies are important to overcome the perception of risks and other similar impediments. This could be supplemented by regulations for compulsory eco-driving training and norms on fuel efficiency. To finance initial subsidies and to manage NAMAs, Viet Nam will need $34 million in international climate finance. GMS countries can also develop Green Climate Fund financial proposals. Thailand, with the support of the Asian Development Bank, has already prepared a Green Climate Fund concept note to source concessional funding for a green freight program based on the two stages described in this brief.